I recently came across this amazing hummous which I have been meaning to share with you. It is pretty incredible. It’s citrusy, creamy with smokey tahini notes on the finish. It’s so delicious, I even found myself polishing the rest off with just a spoon. What drove me to purchase the Pilpel hummous was that it was gluten free, diary free, preservative free and the macronutrients faired pretty well against its competitors. Thinking it would taste pretty clean and bland, I was surprised to be absolutely blown away that something so pure could taste this good. Same can be said about all the other products they have on offer. As I was spreading the good word. By pure coincidence, I unknowingly mentioned it to the national account manager of the range. Bonding over my love for the hummous. He asked if I could sample more of their products and of course I said, “yes”. From left to right (below), we have the aforementioned smokey and tasty hummous, that you simply must try. This is the best hummous you will ever lay your hands on. The beetroot almond dip is vibrant in its earthy flavours while the garlic dip is like the toum you would find in lebanese restaurants. I absolutely LOVE that stuff! I’m just glad that I can buy this in a tub and forego the kebab in order to get it! I sampled the garlic dip with lebanese bread and crackers. But the dip is spectacular with barbecued garlic chicken and lamb. The harissa really packs a punch and was incredibly hot but you can calm things down by adding a spoonful to savoury dishes for some extra kick. 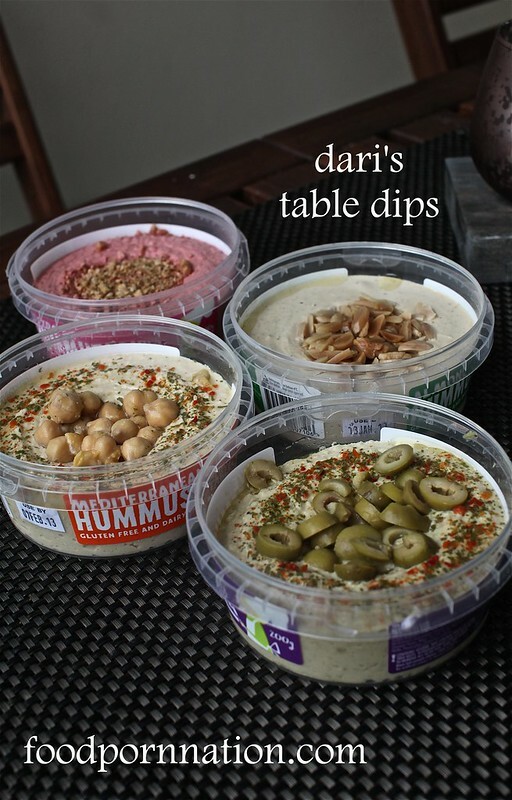 Dari’s Table is the sister brand of Pilpel and I love how the Dari’s Table dips are all ready to go and beautifully presented so you don’t have to worry about serving them up in a separate dish if you’re out and about. My personal preference is the olive hummous, while my sister loved the nutty and fluffiness of the almond hummous. Overall, all the hummous tasted inherently alike just with an added twist at the end. So it is really what you’re in the mood for. 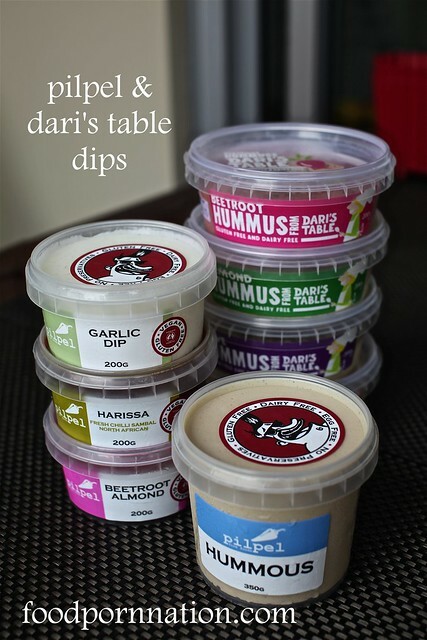 The dips are vegan, gluten, dairy and preservative free. It’s even Kosher. Loyal followers swear by their hummous, naming it as the best hummous that they have had outside of Israel and I’m told, Israel is meant to have the best hummous in the world. Mmmmm yum! I absolutely love hummous and toum!! these are definitely right up my alley 😀 and great for the Christmas season! Christine – the hummous from Pilpel is absolutely heavenly and the toum was a hit over the BBQ. But most of us couldn’t wait so we ate a good portion of it w crackers lol. No kidding, each of those dari’s hummus packages comes with its respective and relatively generous amount of fruit/legume on top? Beetroot…is there any easier way to guess the origin of a food product than when beetroot is involved? :) It’s under-appreciated in the states- though I seem to recall Sri Lankan cuisine paying homage to it. As for Israel and the best hummus- their most common store bought brand (at least in this country) is called Sabra, and it’s absolutely awful. Mayonnaise is found in their baba ghanouj too. That country probably does it well (as any state in that region also would), though the best I’ve had anywhere have surprisingly been in Oman and Jordan. I was referring to the freshly made dips in Israel rather than the store bought ones because all the dips here are meant to replicate home made fresh dips with natural ingredients from Israel. Mayo in baba ghanoush sounds dreadful. OH and I know how you love your beetroot. 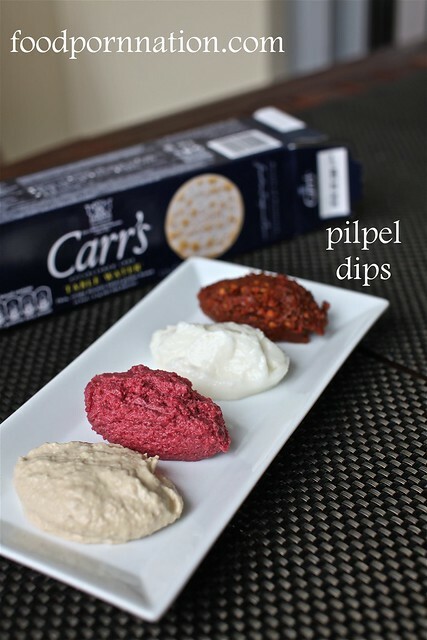 You would have loved these dips. You know we have beetroot on our burgers in Australia? So good! i have their hummus in my work fridge 🙂 so good with cucumber soldiers!